CHICUU: CHICUU:Lace-Up Sweater is Trending Now! 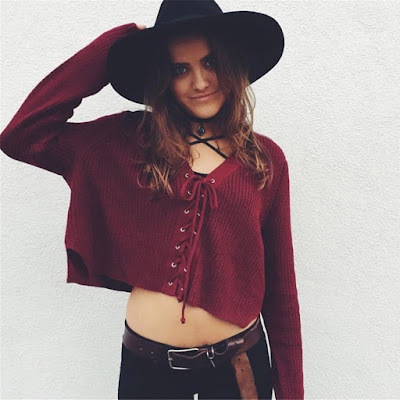 CHICUU:Lace-Up Sweater is Trending Now! Here's one sweater you won't want to cover with a chunky blanket scarf. It's the lace up sweater, which is a new must-have for fall 2016. Lace-up details are an ode to the 70’s style, and lace-up sweaters are the perfect way to incorporate a touch of vintage to your look. Lace-up details and a plunging neckline lend a hint of sexiness especially when worn untied, while lace-up embellishments at the hem or sleeve add a fun spin to your basic knit. No matter what's your style, lace-up sweaters are a great choice for this season. What's more, lace-up sweater can perfect match with tights, boots, jeans or jacket. Here are some Chicuu best-selling lace-up sweaters, come on and pick one for yourself! Have you picked up on the lace-up sweater trend yet?